Photo Exhibition "Children of Palestine | Beyond Numbers" at the Yabous Cultural Centre in Jerusalem, from Monday, June 8 to Thursday, June 11 2015. Opening Monday, June 8 from 5:30 to 8pm / Open daily from 9am to 5pm. The opening event will be held on Monday, June 8 from 5:30 to 8pm; it will include screening of short videos, a music performance by the students of the National Conservatory of Music in Jerusalem, and a catering provided by St George Hotel. 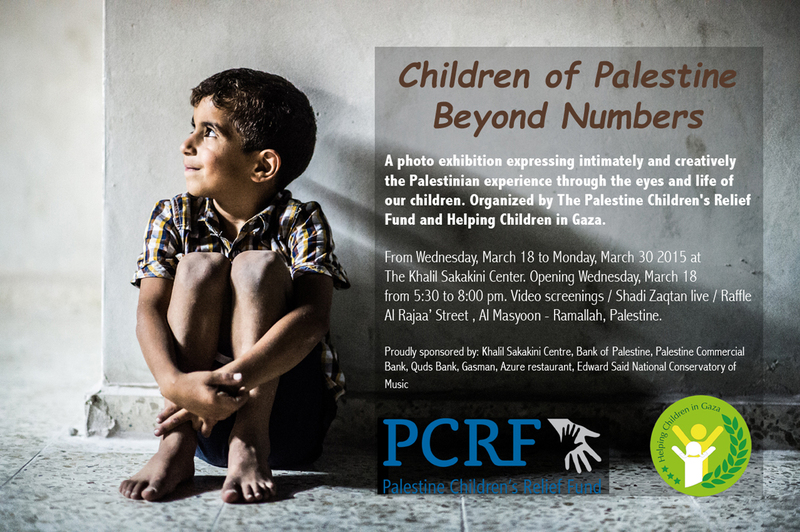 “Children of Palestine | Beyond Numbers” was staged at the Khalil Sakakini Centre in Ramallah from March 18 to 30 2015; and at the Gulf Photo Plus Gallery in Dubai on October 2014. On January 31, 2015, PCRF & HCIG hosted the very first Fundraising Gala for Gaza at St. George Event Hall & Convention Center in East Jerusalem gathering representatives, ambassadors and members of the Palestinian private sector. We would like to acknowledge our generous and supportive sponsors: Yabous Cultural Centre, Bank of Palestine, Palestine Commercial Bank, Quds Bank, Gasman, St George Hotel, National Conservatory of Music in Jerusalem. Yabous Cultural Centre was established in 1995 and has organized hundreds of cultural events including many of the world's most renowned performing artists and intellectuals. The cultural centre has a developmental vision of instilling and reviving culture and arts in Jerusalem that meets the needs and rights of the people. Through various social and cultural events, the centre created a new social reality, artistic creativity, and revived culture in Jerusalem that has been absent for many years.